Each granite slab is unique, which is why many homeowners are drawn to the natural beauty of granite countertops. Whether you choose to install granite countertops in your kitchen or bathroom, you’ll need to make sure you hire an experienced remodeling contractor. 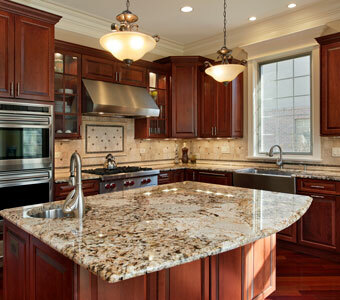 Continue reading to learn our tips for granite countertop installation. We highly recommend seeing the granite slab in person before consenting to have it installed in your home. That way, there won’t be any surprises once you see the final result. Granite is a natural stone, which means that each slab will have different colors, patterns, and veins. We recommend asking the installers to lay out your slab so you have a good idea of where seams will be placed and what patterns will be most visible. Our kitchen and bathroom contractors are more than happy to help you visualize what your new countertops will look like. In fact, we have our own showroom so you can see granite slabs in person. Don’t bargain hunt for inexpensive granite slabs. In the world of contracting, you get what you pay for. Contractors who offer significantly lower prices might be able to do so because they don’t insure their workers or may surprise you with hidden fees later. For example, a dishonest contractor may try to charge extra for a sink cutout. Low prices could also mean that a contractor is trying to trick you into installing substandard materials in your home. We always make sure you understand the full cost of granite slabs and installation before moving forward. Since we value our customers’ business, we make sure you understand the quote and final cost of granite countertop installation. Don’t trust remodeling companies that try to lure you into a contract based on low cost alone. Our remodeling contractors work efficiently and produce quality results. Furthermore, we’ve been helping homeowners just like you since 1981. With such a long reputation, you can count on our expertise for installing granite countertops in your home. While most granite countertops don’t need to be sealed, your contractor may recommend it. Since granite is porous, sealing your countertops will help prevent staining over time. If your countertops need to be sealed, make sure that it’s done the day of installation. That way, you won’t run the risk of staining your new countertops. We use some of the latest equipment to make sure granite slabs are cleanly and precisely cut. Before hiring a contractor, make sure you ask about the installation process so you can determine whether they have the proper equipment to handle the job. That way, your granite slabs will fit properly and look like they were professionally installed. Our Kalamazoo remodeling contractors work hard to make sure you’re satisfied with your new granite countertops. To request a quote for granite kitchen countertops, call Abode Building Center at (269) 329-1800.